To my delight and excitement, the chapter on the North is mostly social history. We look at working conditions, economics, changing family structures, women’s roles, child labor, inventions, unionization, etc. Some of my students seem to be a little restless for a battle to map out, or a president and vice president to memorize, but I love the opportunity to slow down a little bit and look at regional history. However, I don’t think that a multiple choice test is necessarily the best way to test my students’ understanding of this content. 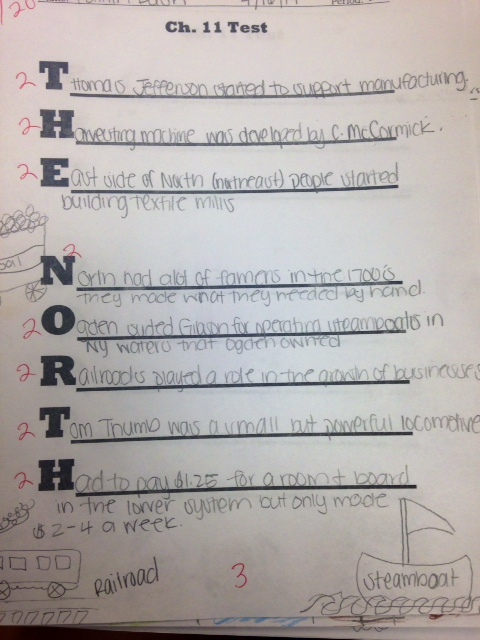 I decided to use an acrostic poem as their Chapter 11 assessment, and I was impressed with the information that they retained and were able to communicate. 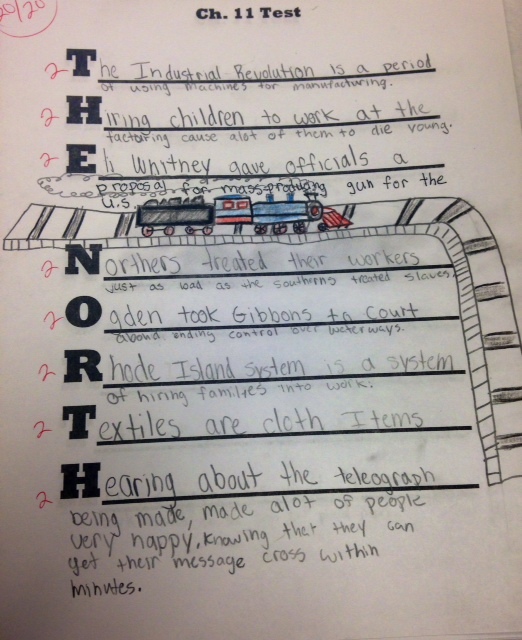 The directions were to write a fact/detail about the North starting with each letter in “T-H-E N-O-R-T-H.” Responses were worth 2 points each, for a total of 16. 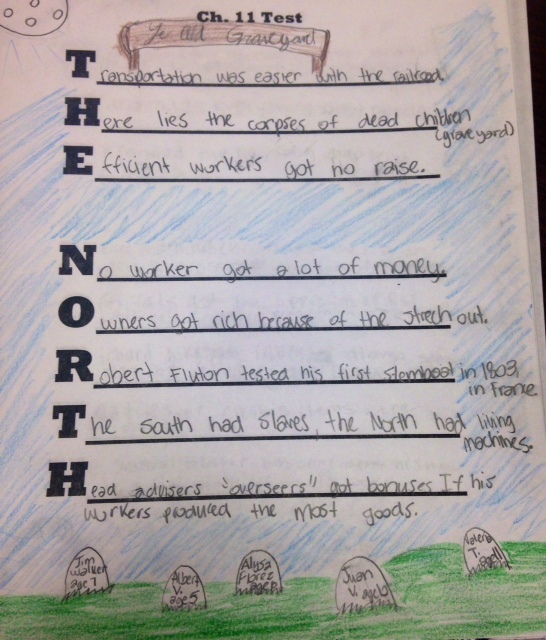 If they wrote something totally uninspired, like “The North was in the north,” they would only receive one point. 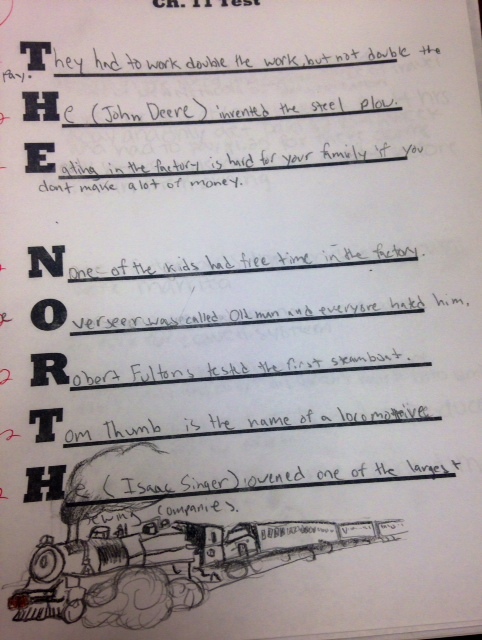 Somewhere on the worksheet they were also required to draw an image of anything related to the North, worth 4 points. Total, the test was worth 20 points. It was a very open-ended assessment, but students produced good work and were actually happy to do it. I had been telling them all week that the Ch. 11 test was on Wednesday, but when I handed it out, they were so relieved they started laughing. Even one of my most negative students said, “This is the best test ever!” They were quiet as mice while they took it, and no one bothered to try and look at their neighbor’s test. To them it seemed “easy,” but it actually required significant knowledge of Ch. 11, and it gave me a good sense of which details they retained the best. The hand-drawn image offered my artistic students a chance to really shine, too. These examples aren’t perfect, but overall students’ scores were pretty high. Quite a few of my students have IEP’s and have a lot of trouble passing tests, so it’s nice to give them a confidence boost every once in a while. It’s definitely true that they need experience taking the kinds of rigorous tests that will be required in high school and beyond, but our school was also taking the SBAC state tests this week. 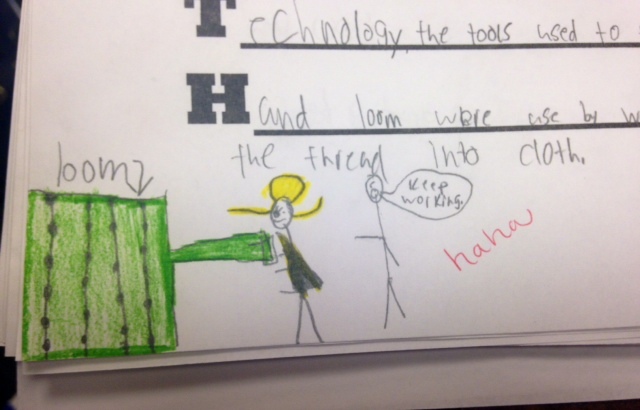 I figure they had had their fill of high stakes testing for the week! The stick man overseer looks so angry! The charm of acrostic poem assessments will surely wear off soon, but they are a nice tool to use every so often. They are much more nuanced than multiple choice tests, and I enjoyed seeing Ch. 11 through my students’ eyes. What are your favorite forms of alternative assessments?